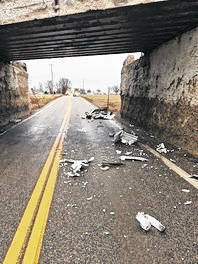 Debris was left in the roadway after a tractor trailer struck a railroad bridge on State Route 521. The Ohio Department of Transportation is reporting that State Route 521 in Delaware County is closed between U.S. Route 36/State Route 37 and Harris Road after a tractor trailer struck the railroad bridge. The road is closed in both directions. ODOT officials estimate the delay will last for several hours. No injuries were reported. ODOT officials said the trailer was empty.